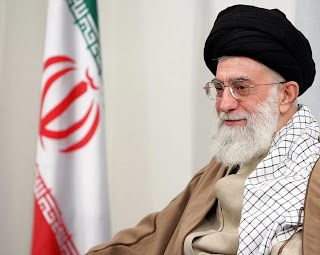 One of the latest rumours on Iran going round the internet and published by the Jerusalem Post and the Daily Mail, is that Iran’s supreme Leader Ayatollah Khomeini said it was time to kill all Jews, starting with Israel’s – and that Iran should use nuclear weapons to do this (1) – (2). Even the International Institute for Strategic Studies are reporting what may well be just a rumour spread by one Iranian exile, possibly for ulterior motives, as fact (3). The Israeli newspaper Haaretz reports, by contrast, that Alireza Forghani is 'an independent blogger and computer engineer'(4). The source for all three sites on the Forghani articles is Reza Khalili, which is the alias used by an Iranian defector to the US and former CIA agent. He has also called for a US war of regime change in Iran. He could well have the same motives as Iraqi defectors had to make things up to encourage a war of regime change that could get them in control of the new government (10) – (12). Many WMD stories on Iraq using Iraqi exiles as their sources – including the mobile weapons labs one, turned out to be entirely false. 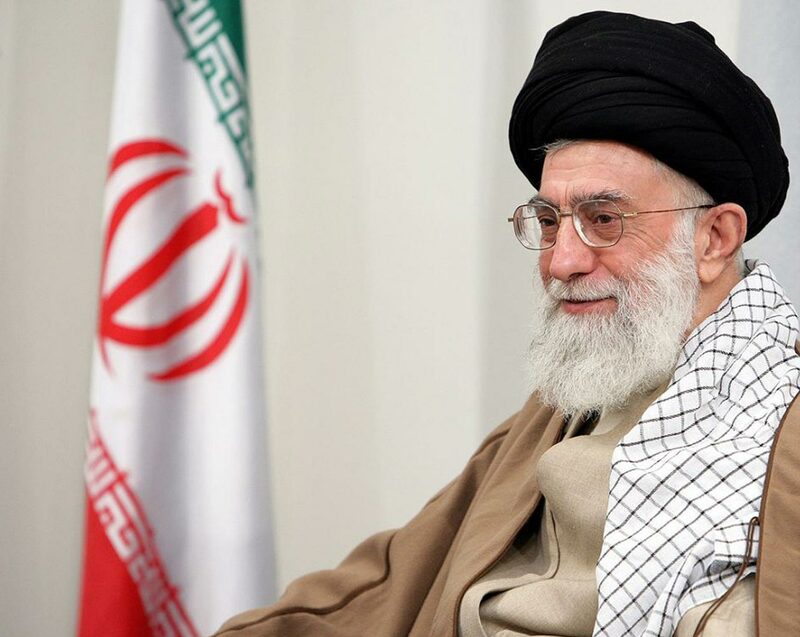 The actual statements by Iranian military and political leaders talk about destroying the Israeli regime (i.e government), which is not a threat to destroy Israel with nuclear weapons (13). I'd thought Donald Trump was the obvious contender for balloon self-inflated by his own arrogance. Maybe Neil Midgely, deputy editor of the Telegraph newspaper is a contender too. 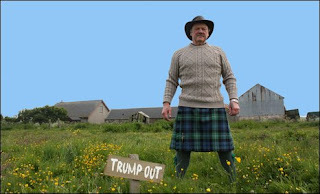 He has a review of the documentary ‘You’ve been Trumped,’ which is Anthony Baxter’s film showing Trump’s SNP government and Grampian police backed campaign to try to force out people out of homes and farms they’ve lived on all their lives, by illegal methods including letting Trump’s employees cut off their water and electricity supplies, build earth berms round their houses and many other intrusions on to and damages to their property (1). Midgely writes " But the …documentary…was so biased in favour of the protesters that it was hard not to end up rooting for Trump and his monolithic capitalist plans. There were endless sympathetic chats with the locals who wouldn’t sell their eyesore properties to Trump….When Trump’s men infuriated the locals – by apparently cutting off their water supply, or building mounds of earth outside their windows – the film’s implicit suggestion was that it was all done out of spite. And if spite was the motive, it was spite so bracing as to be a rare and precious thing. It was also cheering to see the busybody film-maker, Anthony Baxter, at one point carted off by the local constabulary. " (2). First off Neil, they’re not “protesters”. The word you’re looking for is “residents” – people who’ve lived (and in some cases farmed) there for all their lives. They had considerable sympathy and support from many people and there were a few protests in favour of them, which get brief coverage in the documentary – but most of it is interviews with the residents, with police, with Trumps’ spokespeople (who unsurprisingly didn’t have much to say other than threats of getting the documentary makers arrested and charged), clips of Trump making his own case and film of what Trump’s employees and the police were doing, along with interviews with legal experts and experts on the likely impact on jobs from the development (which found, in opposition to Trump’s claims that local people would get a lot of jobs on it, most of the jobs would be likely to go to Polish and other EU migrant workers). I thought that Conservatives were all for property rights, Neil ; Seems not in your case. Seems you're quite happy for billionaires who've bought political influence to come in and take peoples' property and try to force them out of their homes to make way for another frigging golf course (because of course there's a massive shortage of them in Scotland - e.g St Andrews for instance has none, obviously), so long as they're oiks and not your golfing buddies. I thought Conservatives were for upholding the law. Seems not in Neil’s case. He’s fine with money trumping the law; fine with Trump's money, or the promise of some jobs, getting police to let him illegally cut off peoples’ water and electricity supplies and steal parts of their land from them and even build earth berms round their houses. I thought Conservatives were meant to be for civil liberties. In Mr Midgely’s case, seems not. He enjoys seeing people arrested on trumped up charges of 'breach of the peace' and handcuffed for merely interviewing the people involved. I very much hope that you are a victim of similar injustices in future Neil – that your property is stolen by developers, that your electricity and water are cut off to try to force you out of your home – and that the police and government similarly either aid the developers or look the other way as your property and rights and civil liberties are ridden roughshod over by big money. Then you might understand what you got wrong here. On top of that Trump was determined he should get to build not just on 90% of the site he wanted, but that it had to include destroying an SSSI (Site of Special Scientific Interest) containing rare species too. We don’t exactly have a shortage of golf courses in Scotland. St Andrews alone has more than you could count and there are huge numbers of others all over the country. If we lost a golf course we could replace it. If we lose rare species to extinction there is no getting them back though. They are gone forever. SNP First Minister Alec Salmond decided to over-rule the elected local council’s planning committee – and it’s SNP chairman in 2009 – to give Trump exactly the planning permission he wanted. His government must have either looked the other way or else seen to it that the then SNP headed Aberdeenshire local council got the police to do a mixture of looking the other way as Trump’s employees broke the law on other peoples’ property, guarding the law breakers as they did so; and harassing and arresting the documentary makers (including by arresting them and putting them in a cell for four hours by mis-using the catch-all ‘breach of the peace’ charge). Salmond calculated that he would gain more votes by the jobs created and sports coverage of the new golf course than he would lose by allowing an arrogant billionaire to over-rule the local council, destroy habitat for rare species and force people out of their homes. Even the most charismatic and intelligent politician can get his sums wrong where he doesn't factor in right and wrong though. In a case of poetic justice he’s suffered negative media coverage (largely due to Anthony Baxter’s work) combined with a feud with Trump over plans for offshore wind turbines off the coast of his golf course development. The recession created by the financial crisis has also reduced investment and demand for Trump’s development, which might fail yet. Next time Salmond is engaging his brain purely as a vote calculating machine he should remember this and take right and wrong into account too. However those arguing that this shameful episode is due to Scotland being too small to resist big money’s influence and using it as an argument against independence have it wrong too. The British and US governments cave in to big firms, banks and billionaires constantly. Just look at the NHS contracts going to Circle Healthcare whose shareholders lobbied for privatisation and donate to the Conservative party ; or US military aid of over $1bn a year to Egypt, openly given to subsidise US arms firms that make political donations to Presidential and congressional campaigns, particularly Lockheed Martin (3) – (9). That’s not to mention all the white-washing of the pollution of water and air by fracking and on land oil drilling in the US due to the big oil and gas companies buying up political influence and even funding biased scientific studies (thankfully countered by neutral ones). So the problem isn’t the size of the country, but big money buying influence through private donations to election campaigns and political parties; revolving door syndrome allowing people to go between jobs in those firms and the government departments giving contracts to and regulating them ; and governments’ choosing jobs from multinationals, which may go overseas as quickly as they arrived, over backing smaller businesses based in their own country. (the last problem being the relevant one with Trump and the SNP – though it’s possible Salmond also hoped to get donations for his party, though I’ve found no evidence he got any) (10) – (11). The solution is to make it a criminal offence to give or receive private political donations, or to go from a job in a government department to a company given contracts or regulated by it, or vice-versa, for 5 or 10 years; and provide limited, equal, public funding to all candidates in elections. Sign the petition against Trump’s illegal campaign to drive people out of their homes . 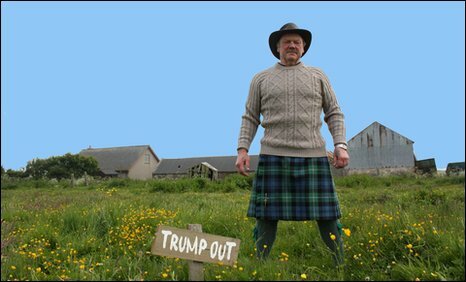 Join and/or donate to the Tripping Up Trump campaign group against forced compulsory purchase orders being issued purely for the benefit of big developers. http://www.guardian.co.uk/healthcare-network/2012/oct/22/public-service-private-blurred-boundaries ; ‘the resignation from the NHS Commissioning Board of Jim Easton to become managing director of the private provider Care UK…Previous senior officials in the Department of Health transferring their wallets to the private sector include Matthew Swindells, chief information officer at the DH who joined KPMG, along with Mark Britnell and Gary Belfield, who had run the DH commissioning programme; Simon Stevens, Tony Blair's senior health advisor from 1997-2004 became a vice-president for United Health; and Penny Dash, formerly DH director of strategy, left for McKinsey. First Minister Alex Salmond, writing in the Sunday Herald (‘Why we can ban nuclear weapons and stay in Nato’ Sunday Herald 14th October) gives welcome assurances that an independent Scotland in NATO wouldn’t take military action without UN authorisation and a Scottish parliament vote, mentioning Iraq (1). He doesn’t mention NATO’s UN backed war in Afghanistan though. NATO membership could draw an independent Scotland into similar unwinnable wars, fought for dubious motives and with dubious methods, in future. Nor does he explain how we could persuade the UK government, let alone the US, the most influential member of NATO, to allow us full membership while costing the UK a fortune to move it’s submarine bases, especially when Trident contracts are going to English and US based firms with (excessively) close links to the British and American governments. Even UK Ministry of Defence base maintenance and submarine refit contract work on Trident submarines has gone to a British subsidiary of the US Defence firm Lockheed Martin, the English based company Babcock and AWE plc (based in Reading, England and two-thirds owned by US based Lockheed Martin and Jacobs Engineering, with the rest owned by the UK government and English based firm Serco (2) – (3). The first £350 million of Trident upgrade contracts went to Lockheed Martin, English based Rolls-Royce and English based firm BAE, which also has a large arm in the US (4). BAE is expected to get most of the rest of the upgrade contracts too (5). The Campaign Against the Arms Trade in the UK has also shown dozens of instances of the revolving door between these arms manufacturers and the MoD, the British government and senior positions in the British military (6). According to the MoD building another base suitable for the UK’s nuclear submarine fleet in England, Wales or Northern Ireland could take up to a decade (7). So why would the remaining UK government support NATO membership for an Independent Scotland except on the condition that we allowed it to keep its nuclear submarine fleet and it’s only base capable of repairing, maintaining and refitting that fleet in Scotland? A nuclear free independent Scotland might even result in the UK dropping it’s Trident upgrade altogether and going for a joint nuclear deterrent, or at the least temporary base sharing, with France, preliminary negotiations on which took place both under the last Labour government and under the current Conservative-Lib Dem Coalition (though the French government seems keener than the British) (8) – (9). That would mean the UK’s military co-operation with France would become closer, reducing US influence with the UK. US firms would be likely to lose out even if this didn’t happen. Either way the US government would not be happy. So a nuclear free Independent Scotland and NATO membership are simply not compatible with each other. We need to choose one or the other ; and if we want to avoid paying for maintenance , running costs and upgrades of the UK nuclear deterrent, we need to choose being nuclear weapons free. Nor does the First Minister offer any guarantee of a referendum on any decision to go to war that would give the Scottish people the final decision on an issue of many lives and deaths ; nor any guarantee that backbenchers or the opposition in an independent Scottish parliament could initiate a vote (or a vote to have a referendum) on withdrawing our troops from a war they had previously voted to approve sending troops to. 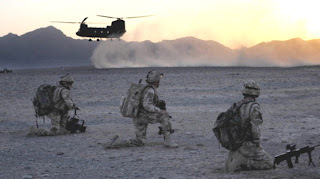 The Afghanistan war has pulled in the UK as a NATO member; and even those members of NATO (e.g Canada and Poland and even Norway which sent special forces to the initial US led invasion and then over 500 troops to the ISAF force which are only now leaving) and its joint-training associated arm Partnership for Peace (e.g Ukraine), ended up sending significant numbers of troops either to the initial invasion or as part of the UN approved but NATO (and effectively US) led ISAF force, or both. Hundreds of British troops, including Scots, have been killed in the war, which has lasted over 11 years and counting, twice as long as World War One, coming up twice as long as World War Two; and over half way to being as long as the Vietnam war (10). It has also involved not only the notorious killings and suicide bombing attacks on civilians by the Taliban, but also torture of Afghans by US, NATO and Afghan government forces, including civilians with no involvement in terrorism, sometimes to death; and many thousands of civilians killed by air strikes under Bush, as well as by air strikes and night raids (often targeting teenagers who turn out to be innocent) under Obama. Civilian deaths from US air strikes actually increased under Obama compared to under Bush and torture has continued at secret ‘black sites’ in Afghanistan under Obama (11) – (19). US intelligence estimate 90% of Afghan insurgents are neither Taliban nor motivated by religion, but by opposing foreign military presence, or revenge for the injury or deaths of members of their family, village or tribe by NATO forces (20). So this is not primarily a war against the Taliban at all, but one which turns the majority of Afghans against NATO countries and the Afghan government. NATO says Pakistan’s military intelligence continue aiding the Afghan Taliban , despite now being at war with the Pakistani Taliban (21). Yet the US continues to provide financial aid to Pakistan, some of which will be passed on to the Taliban, because the shortest supply route for NATO forces in Afghanistan is through Pakistan (22) – (24). So NATO has to indirectly fund the Taliban in order to supply it’s troops in Afghanistan – a hopeless situation. Wars are not effective against Al Qa’ida, a global terrorist organisation which can operate in any country in the world, the 9-11 hijackers having trained in the US and Germany (25) – (27). Intelligence, policing and Special Forces can be. Would backbenchers in the Scottish parliament have the power to initiate a vote on withdrawing troops from wars parliament had previously approved by majority vote? Shouldn’t a referendum also be required before going to war to give everyone a say in a matter of life or death for thousands. Alec Salmond is certainly making smooth moves by trying to make voters see independence as less of a big risk, by reassuring them that lots of things will remain unchanged – NATO membership, EU membership, our currency, the Queen as head of state, an open border with England etc. However the status quo carries its own risks. In the case of continued NATO membership the risks are not only that we might be required to keep nuclear weapons on Scottish territory and continue to pay a proportion of the costs of running, maintaining, refitting and upgrading them as a condition of continued membership (despite the fact an independent Scotland would have no more need for a nuclear deterrent than Norway does), but also that we could be drawn by the alliance into more long, bloody, unwinnable wars fought mostly for the benefit of US and British oil and arms companies. You can sign an online statement opposing NATO membership for an independent Scotland on the No to NATO Scotland Coalition website on this link (scroll down the page till you see an orange button with 'Sign the Statement' on it on the right - click it, fill in details and enter them). There's also news and information, including on protests by the campaign that you can take part in, on the website.